This year’s theme is Bollyweird: The Cosmic Dance. In a spirit of cross-cultural appreciation, we will feature music and art from India and beyond. The faire’s centerpiece will be a Temple to Shiva and the Cosmic Dance. The faire will end with our version of the “Cosmic Dance,” attempting to break the world’s record for the Largest Bollywood Dance. A special peace remix of the Bollywood song “Jai Ho” has been created by local artists who have played at the faire. It was produced by Outersect, with vocals by Irina Mikhailova, and additional production by Neal Stewart. “Jai Ho” was chosen because it is one of the most popular and recognizable Bollywood songs in the world. The original song has appealed to people from diverse cultures and backgrounds, as well as it’s prominent role at the end of “Slumdog Millionaire.” Bollywood has become the largest film genre in the world, representing the globalization of communication technologies. The JAI HO SHANTI REMIX will be played at the conclusion of the How Weird Street Faire on all ten stages simultaneously. 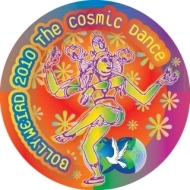 The Cosmic Dance is a concept from India that represents the movement of the universe, from the galaxies and planets, to all life, to subatomic particles. Dancing is the only art in which the artist and the art created are one and the same. According to Hindi mythology, Lord Shiva is the Cosmic Dancer who performs his divine movement which perpetuates the process of creation. The Cosmic Dance of Shiva is called Ananda Tandava, meaning the “Dance of Bliss,” and symbolizes the cosmic cycles of creation and destruction, as well as the daily rhythm of night and day.